Plus, Piedmont approved a controversial sports park and flooding threatened the historic oak tree at Oakland City Hall. Jean Quan has taken a political beating this fall, particularly from Occupy Oakland and the insurgent recall campaign. But on Friday, the mayor came out swinging with a new proposal to build a massive sports village at the Oakland Coliseum. Dubbed "Coliseum City," the project is designed to be privately funded and would include a new ballpark for the A's, a new stadium for the Raiders, and a new arena for the Warriors, along with a convention center, hotel, and retail strip. Although some of the mayor's critics scoffed at the sweeping plan, city officials said they've already received interest from six private development teams in response to a request for bids. Coliseum City also appears to have strong support on the city council. "It could really be a transformative project," Councilwoman Rebecca Kaplan told the Express. "I'm really excited." Kaplan has been working on the plan with council President Larry Reid, who said he's also jazzed about it. "It would just be incredible if we were able to do something bigger and better than AT&T Park or LA Live" in Los Angeles, he said in a phone interview. The mayor's announcement followed news last week that the Warriors' owners had talked with San Francisco Mayor Ed Lee about a possible new basketball arena near AT&T Park. The San Francisco Chronicle reported that the Warriors also talked to Quan about a new arena in Oakland — apparently it was about Coliseum City. In addition, the San Francisco 49ers have been trying to convince the Raiders to move to the South Bay and share their planned new stadium in Santa Clara. There also has been widespread speculation recently that Major League Baseball will soon green-light the A's planned move to San Jose. The team has been assembling land there, and A's co-owner Lew Wolff is good buddies with baseball commissioner Bud Selig. However, it remains unclear how the A's can overcome the San Francisco Giants' territorial rights to the South Bay, which prohibit any other major league club from moving there — unless three-fourths of the league's owners agree to it. Still, if Oakland were to lose three professional sports franchises to nearby cities on Quan's watch, it might be a death blow to her political career. And keeping the teams will be no easy task. It remains to be seen, for example, whether the city's efforts to keep the A's will be successful, because the team's ownership desperately wants to leave. 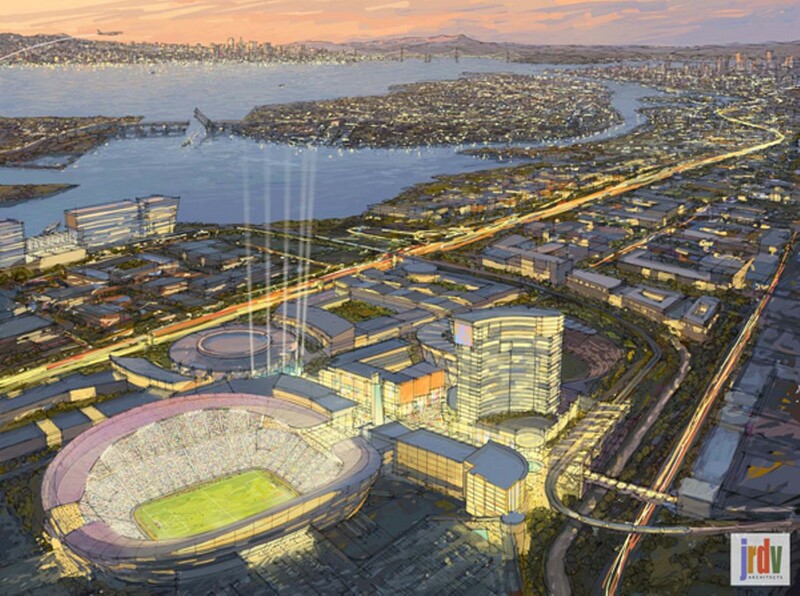 Moreover, questions abound as to how Oakland would be able pull off a major new development like Coliseum City, especially if the state Supreme Court sides with Governor Jerry Brown's plan to kill redevelopment in California. Kaplan, however, said Coliseum City could potentially be built without redevelopment funds because the city and county already own the land. Kaplan noted that the city has been buying up property around the Coliseum so there is plenty of space for the large development. Kaplan also is working on scoring $40 million in funds from the Alameda County transportation plan. Because of its proximity to BART, rail, and I-880, the project may be eligible for transit-oriented-development funding. As for Quan, Coliseum City represents a chance to shift the conversation in Oakland away from Occupy and the recall. She said that her administration has been talking to Major League Baseball about Coliseum City and she feels upbeat about its prospects. That's not to say, however, that she has completely given up on the possibility of a waterfront ballpark at Victory Court in the city's Jack London District not far from downtown. "That's still my favorite site," she said. Follow the money: in this case, $6 million. A group of Piedmont residents offered it up years ago to construct a new soccer field and miniature sports complex on the city's last remaining open space, and last week the Piedmont City Council formally accepted. The meeting lasted until 2:30 a.m. thanks to a parade of speakers, reported the Piedmont Patch, but in the end the council voted just as it has in past Blair Park decisions: four in favor, and one, Councilman Garrett Keating, opposed. Criticism of the project ranged from environmental concerns to traffic and public safety issues related to putting a sports park on busy Moraga Avenue in a narrow canyon. "It's a very disappointing decision," said Marjorie Blackwell of Friends of Moraga Canyon, a citizen's group that has led the often passionate opposition to the project among Piedmont residents. "They're very determined to go ahead with this project. There's been this relentless drumbeat to do it. It doesn't seem to matter what we say; they're still going to do it." Some Oakland residents raised concerns last week that the historic oak tree in front of Oakland City Hall was being threatened by flooding of the plaza following the removal of the Occupy encampment. Molly Batchelder of Oakland charged that the city was purposely overwatering to keep the occupiers from returning. But Quan's spokeswoman, Sue Piper, suggested it was a water leak or that the city was heavily watering the plaza to regrow the lawn that was killed by the Occupy encampment. Whatever the reason, too much water could doom the historic oak. A common rule of thumb is that the diameter of the root system of a mature tree is approximately two to four times the diameter of its crown. This means that the oak's roots extend to the flooded area of the plaza — well beyond the concrete barrier that immediately surrounds the tree. Improper watering can leave roots prone to disease and pest infestation, and once a root system is severely affected, the tree usually must be removed. The morning after the Express reported about the tree on its website, a city Public Works employee showed up to check the sprinkler valve in the tree well to ensure it was closed tight, test the soil moisture within the tree well, and take a series of photos around the base of the tree. Thousands of Occupy protesters shut down the Port of Oakland on Monday despite opposition to the blockade from unions and public officials, including Quan. ... Little Hiram Lawrence Jr. died at Children's Hospital in Oakland from a gunshot wound to the head. The one-year-old was struck during a West Oakland shootout in what police believe stemmed from a gang rivalry. ... Amazon.com angered small businesses nationwide with a predatory app that awarded discounts to shoppers who scanned bar codes in stores and collected price information for the online giant. ... And the effort to reopen the Parkway Theater in Oakland may end on December 31 if a new home cannot be found. The theater has been searching for a new venue since the original incarnation lost its popular Eastlake location in 2009. The New Parkway's Moses Ceaser said that a recent attempt to purchase property at 2800 Broadway fell through.